I am happy to hear that so many of you are avid canners. That is so refreshing to hear, as sometimes it feels like it is a lost art and people give you the “roll the eyes” look when they hear that you are actually doing THAT! 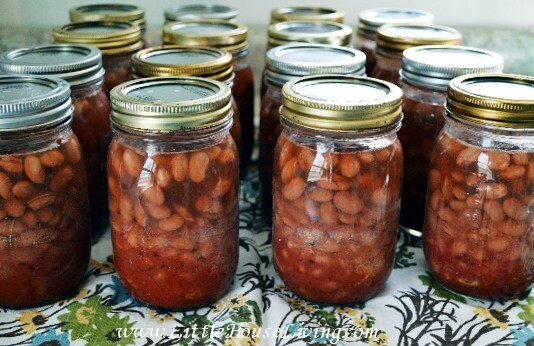 Here is another canning beans recipe that I believe you will enjoy, also. Someone had asked about a sweeter type version of beans and this is the recipe that I have been using to fill that. You can eliminate the “pork” part of this recipe, if you prefer. I didn’t take you through the whole process, step by step of soaking/cooking this recipe. You can refer back to the Soaking Beans or Canning Beans articles. This is just a basic recipe that I have been using for the last couple years. Soak beans over night. Rinse thoroughly. Cook beans for 20 minutes on the stovetop. Drain beans and mix with all ingredients. Pack in jars. Add approximately 3 1/2 cups per quart, 1 1/2 cups per pint (do not overfill). Process in pressure canner for 1 hour pints, 1 1/2 hours quarts at 10 pounds pressure. Please check with your local extension office for any changes on times/temps/high altitude. If you would like to see more canning recipes, let us know! Make sure you check out all the free Canning and Preserving Recipes we have on Little House Living! Julie is Merissa’s mom and she’s committed to living a frugal and simple lifestyle. 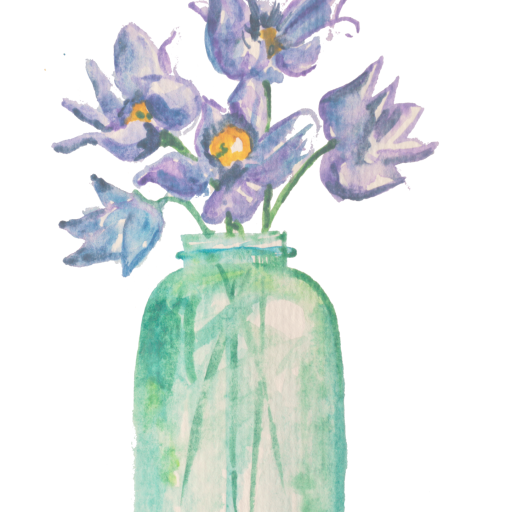 Julie grows her own herbs in her garden and enjoys making things at home. You can now find her home remedies and ideas here at Little House Living. Thank you! Pork & beans is the only beans that I have tried and failed to make homemade. Definitely trying this:) I freeze my black beans, pinto, etc. Think these would freeze well? These always make for a yummy and quick lunch around our house. Those look sooo good!..I hate the name brand ones!..what is that fat glob that is in them, anyway? I think canning is the wave of the future. With all the GMOs out there, junk and chemicals in our food, and the huge companies out there who are trying to eliminate heirloom seeds and making GMO seeds, people are desperately trying to grow their own crops, save the seeds and can their wares because of all the horrific junk in food. I am really getting into all this GMO free way of living and antibiotic and hormone free. It is astonishing what you find out there when you do a little digging. I can’t wait to can more this summer and we are extending our raised beds by making 5 more – probably 4×6 beds! I can’t wait! I love your site and thanks for all the great canning stuff. I’m growing heirloom beans this year – and I’ll use them in the pork and beans recipe! Holly, I have never tried to freeze these, however, if you do, I would think it would be best to cook them fully with all the spices, etc… and then just freeze them. If you try it, let us know how they turn out . Mel, I use side pork in my recipe. If we are going to use pork products, I like to use them that are not treated with preservatives or flavoring. That is a piece of the side pork that you are seeing in this picture of my canned pork and beans. I’ve only recently gotten into canning, so I love these posts and recipes. Keep them coming! I really will have to try this one. Wonder if this could be done with turkey bacon? wonder if that would ruin the taste? I have tried canning pinto beans, white/northern beans and potato’s several times. 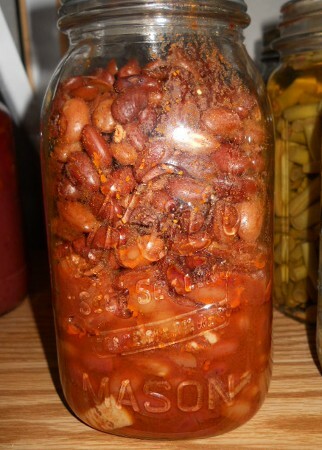 My problem is this, the jars seal, but then the seals explode days later- leaving me with a “stinky” mess.. What am I doing wrong?, and what is the secret to canning beans -as well as- potato’s without them spoiling? Wish you lived in Tennessee ! I could learn a lot from you and your mother..
Love your site! I am a “Laura” wannabe! I love canning, I put up about 400 jars a year. I do beans every 6 months, about 60 quarts each time. I have a question for the above post by Madonna, what is your method for doing your beans? I never have a problem with mine. I rinse and soak my beans over night. In the morning I put them in my roasters with clean water, bring them to a boil and then set the timer for 30 min. After 30 min I put them into my hot jars (with salt) and then I pressure can them at 10 pounds for 90 min. I hope this helps you! just found my new favorite site…thanks!!!! can you process these beans recipe in a hot wager canner as I want to try them but don’t have a pressure canner…thanks!! I am canning your chili beans today. Do you have a great recipe for canned baked beans? I did some a while back, using a tomato-sauce base, but I think what my family would prefer is more of a molasses-based sauce. It’s a bummer when you put up 15-20 pints of something that your family dislikes! I’ve still been serving them, but dousing them in Trader Joe’s barbeque sauce, lol! Our favorite store-bought baked beans are Bush’s homestyle. Do you have anything like that? Camille, if you find one, I’d like to try it too. I’d like a Bush’s type baked bean I can make a big batch of and can. I worry about canning beans. I had one jar go bad once and thank heavens we noticed before I killed someone. Have you ever had trouble with beans? As long as you pressure can them at the correct pressure and time and they properly seal they should be fine. I haven’t had any trouble with it yet. I have a bunch of pinto beans~do you think using them instead of white would change the flavor very much? And have you ever tried cooking them in the crockpot and freezing them? I’m trying a refried bean recipe in the crockpot and I think I may give this one a try too. I’ve cooked them in the crockpot many times and then froze them and they turn out great. And I think you should be able to sub pinto beans without a problem.